A jackpot, or progressive jackpot is a massive win in a slot machine, where the total value increases a small amount each instance of the game played. The amount that the price advances by for each spin is set by the provider and vary from game to game. For online casinos a jackpot can be local to the site or gaming group, or pooled where all casinos offering the same game from a third party developer contributes to the total amount. When there is a larger pool of players and casinos contributing to a total jackpot, it also means it grows more quickly. Many lotteries also feature progressive jackpots as a means to increase the biggest possible win. Usually a jackpot is paid out to a winner that gets the highest payoff combination. Once a player wins, the value is reset to the preset minimum level. Some slot machines offer both local and pooled jackpots, where typically the biggest price is pooled. 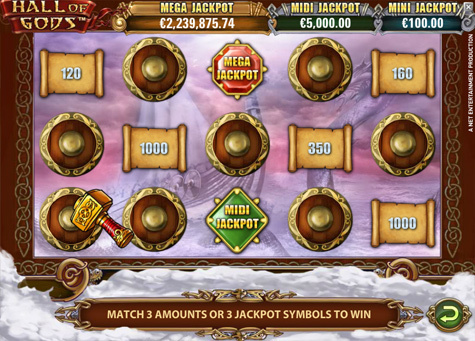 Hall of Gods by NetEnt offers both pooled (Mega) and local jackpots (Midi, Mini). What is a local jackpot? A local jackpot is generally a big win prize in a specific game that can be won any given time and you can find the money in your account straight away. These are exclusive to the online casino you’re playing at, which means the same game can offer different sized jackpots at the same time depending on what site you’re playing at. What is a pooled jackpot? When a game developer links casinos or games to one common price its called a pooled jackpot. This is done to be able to offer a much larger amount as the biggest price in a slot machine. Each casino or slot machine in the pool group contributes a small amount based on their customers activity to this progressive jackpot, and once won – it is reset for all players on all casinos. The amount payed out to players for the progressive jackpot is usually far higher than any single slot machine or casino could pay on its own. These pooled jackpots are not won every day, as they take a lot more time to build – but the amounts can go up to hundreds of thousands or even millions of euros. One example is Mega Fortune that is featured in the Guinness World Records for a record-breaking payout in an online slot machine of €17.86 million generated from their pooled “Mega jackpot”. The same slot also broke a world record on mobile in 2015, with a payout of €8.6 million. The game also feature local “rapid” and “major jackpots”, that are smaller but more frequently paid out. A big difference to a local jackpot is that the pooled win is not payed out by the online casino where the player won, it is paid out by the developer of the game.